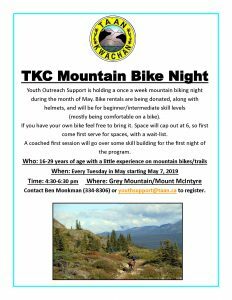 Who: 16-29 years of age with a little experience on a mountain bike/trails. Thank you to all who made last year’s youth Activity Days a success! 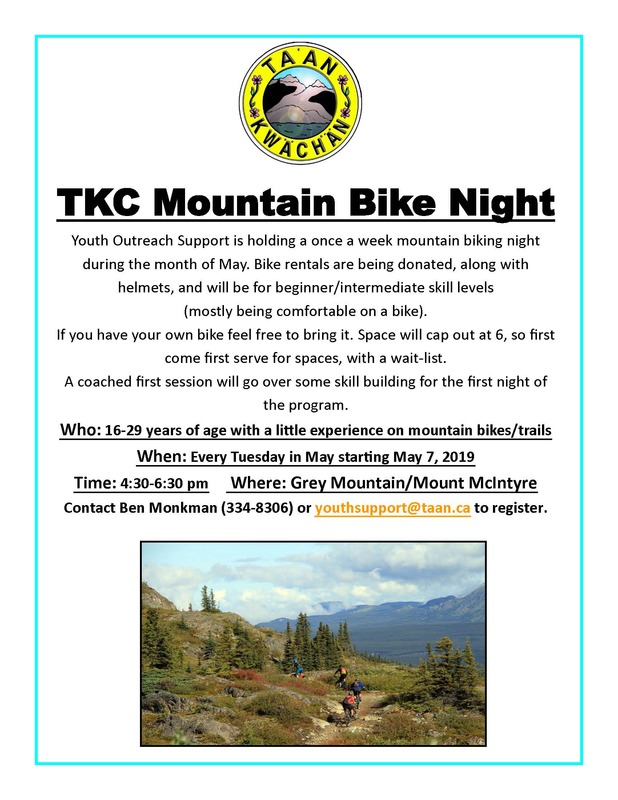 We are looking to continue this program for the summer of 2019, and looking to expand what we provide here at Ta’an for our young people. We are brain storming on new ideas and partnerships. Youth opinions, and suggestions, are welcomed going forward. It would be great to hear what you would like to do this summer! Any ideas can be sent to Ben Monkman, youthsupport@taan.ca or phone 334-8306. I look forward to hearing from you soon. We are working with Inner Vibe to create a new partnership that will see our youth gaining knowledge from the programs Inner Vibe run, like; music production, silk screening, art projects, mural projects, creating Shakat Journal content, etc. Again, we would love to hear from you! If these are something that you would like to learn more about contact us and we can start to create programming! Feel free to contact Ben at youthsupport@taan.ca or call 334-8306. Taan is focused on the academic success of our children and youth. We are always looking to create situations that benefit students and their families. Currently we have a few programs in place: after school tutoring offered through LDAY, First Nations Graduation Funding (including money for regalia and sewing program in the evenings), school lunches, and school office hours. We currently provide a lunch to our Elijah Smith students on Wednesday after the lunch recess in the Southern Tutchone language room. I will be at Porter Creek Secondary School Thursdays from 1-3 in room 225 If you attend a school where I do not have office hours please feel free to contact me and I can come and visit, and provide as much help as needed for school success. Any parents that would like to know more, or work together to promote educational success, please contact me at youthsupport@taan.ca or call 334-8306. We are always looking to engage our youth in the community, and we know how important your input is to that success. Please feel free to contact me with any news, ideas, concerns, and just someone to talk too. Stay tuned to this page for upcoming programs, events, and news. We also are planning on creating a calendar for events in the community, and make it easier to access events. Thanks in advance! Our Culture and Heritage department is starting a dance group! There are looking for young people, along with all ages, to create a health and vibrant dance group. From; singing, drumming, sewing, to storytelling, this group would like your help and involvement. Dates are in the works, but it would be awesome to hear who might be interested. Contact Ben (youthsuppport@taan.ca ) or Roberta (rbehn@taan.ca) with questions and updates. See everyone soon!